When Was Your Elder Loved One's Last Cataract Check? When Was Your Elder Loved One’s Last Cataract Check? Is your elder loved one at risk for cataracts? If you’re not sure, then it may be time for you to find out for sure. Having up to date information about your loved one’s eye health is essential for him. There are a range of different signs that your loved one might be starting to develop cataracts. Some of them start showing up in your elder loved one’s 30s or 40s, even, and only worsen in later life. If your loved one is experiencing blurry or double vision, you should make an appointment for him right away. Some other signs can include needing much more light than usual in order to read or difficulty seeing obstacles in lower light. Your loved one might also find that his current eyeglasses don’t seem to help him to see any better. Not all of these factors mean that your loved one will definitely develop cataracts, though. Eye doctors aren’t sure what the differences are from person to person, but there is a high degree of variability. The most important thing that you can do for a loved one who either might develop cataracts or who already has them is to keep up with regular eye appointments. Having his eyes regularly examined can help to make sure that your loved one’s eye doctor is well acquainted with his current eye health and can therefore spot problems more readily. Your loved one can have faster access to treatment when you’re more aware of his eye health. You can also make sure that his eyes are protected with wide-brimmed hats and sunglasses that block UV rays. If your loved one smokes, quitting would be a good idea. Other tips from your loved one’s doctors can give you more specific information. 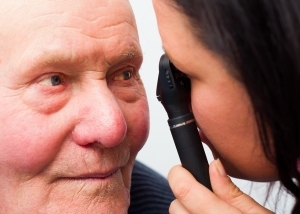 Even if you can’t go to the eye doctor with your elder loved one, it’s important that he’s checked right away. You can ask other family members or your loved one’s elder care providers to go with him. This entry was posted in Elder Care Germantown TN and tagged Elder Care Germantown TN. Bookmark the permalink.